Certain times of year can be incredibly inspiring for beaders and all types of artists. The sounds, smells, colors and emotions that accompany our favorite seasons and holidays translate well when imitated with beads and other materials. In autumn, the rich colored foliage and ancient harvest time traditions are what motivate many of us to create. At Eternal Autumn, artist Lara Blair uses her love for all things fall to channel the amazing images and feelings of October’s macabre side into amazing jewelry. From vintage, vampire and Victorian inspired pieces, to charming Halloween designs, her work is steeped in autumn elegance. Inspirational Beading: How did you first discover the art of jewelry design? Lara: My love of jewelry started early. 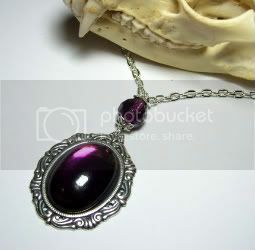 I played dress-up in my mother's and grandmother's jewelry boxes long before I understood than someone had designed the pieces I was piling round my neck and wrists. The colors and textures intrigued me. I still remember specific pieces to this day. A bright red and black acrylic bead necklace (that my grandmother had set aside as “safe” for play) was a particular favorite and I remember digging through her costume jewelry to find other pieces that coordinated well when I was just 5 or 6 years old. Inspirational Beading: Do you have a favorite source for inspiration? Lara: Vintage or antique style... from the decadent detail of 16th century pieces to the heavy darkness of Victorian mourning attire… I love it all! Lara: Well I hate to be obvious but BLACK! It’s so versatile and a wear-with-anything staple for almost any style. 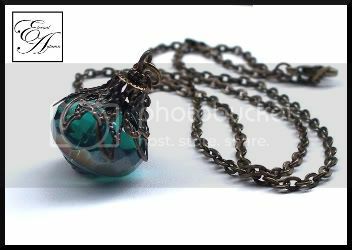 Also, “Picasso” finished Czech glass beads, which come in a variety of colors but always add a vintage feel to any piece. And as far as metal is concerned, I'm a sucker for dark silver, also known as gunmetal. Lara: Bead-weaving, peyote, loom work or perhaps even quilling. 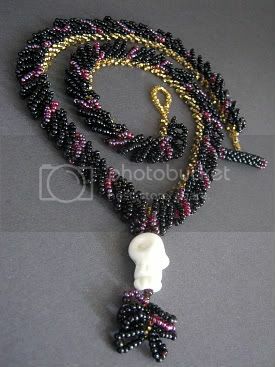 I dabbled a bit when I was a teenager but became taken with metal work… but I've always had a soft spot for bead-weaving. Lara: I hope to inspire my fellow artists to continue to grow and to share their work with others, to nurture the creativity within. Its true that one of the best ways to know you're truly alive is to create. Lara is a busy work at home Mom, jewelry designer, artist and entrepreneur. Her first jewelry designs were made with plastic beads and stretch cord, and have since evolved into intricate pieces, inspired by her love of all things autumn. She’s known for her love of anything pumpkin related, and a penchant for long skirts. An artist is a creature driven by demons. He doesn't know why they choose him and he's usually too busy to wonder. 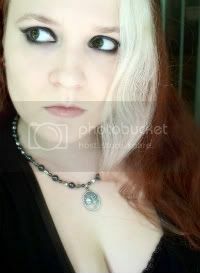 You can check in and see what’s new with Lara and Eternal Autumn on her MySpace page, and on Facebook. Female villains are often some of the most terrifying in film and literature. They are usually beautiful as well as cruel, which in many cases makes them all the more terrible. As the protagonist usually realizes much too late, looks can be very deceiving. After creating a scary forest necklace inspired by Disney’s Snow White, I wanted to pay a little tribute to the evil queen. Although terrifying and cruel, she was the second fairest in the land, and surely had a wardrobe to suite. I wanted to make something that would be fitting for a queen, but with a touch of the macabre. I started with some dark transparent root beer 8/0 seed beads, which have a nice color that could blend between reds, blacks and other ‘evil’ colors. 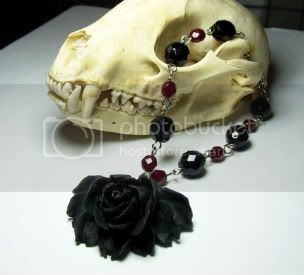 To these I added opaque red 11/0 seed beads, shiny black 11/0’s, and a charming lampwork skull bead by Suzoom. I really love the ornate looking face on the skull - it looks like something a witch would use to cast a spell or tell your fortune. 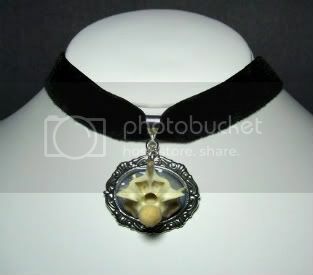 At first I thought it would look nice to have a dark colored spiral rope, with the skull at the centre as a pendant. In my mind’s eye, the necklace looked great, but as I stitched, I realized that it wouldn’t quite do the skull bead justice. I went back to the drawing board, and came up with an entirely new design. First I added some golden colored beads, which I hoped would make the beadwork look more regal. Once those were included in the palette, I decided to replace the opaque seed beads with transparent ones, so that they would blend together with the foil-lined beads, and the shiny black ones. Instead of a spiral rope, I used the golden beads and the 8/0’s to make a V-shaped St. Petersburg chain. 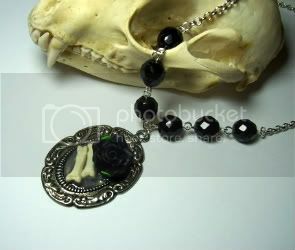 Once finished, I added scalloped loops in black and red, and attached the skull pendant with a seed bead fob at the end. It turned out so much better than my original idea, that I have no regrets about the spiral rope now sitting in my to-do drawer. When it comes to choosing just the right beads for a project, the possibilities can be pretty overwhelming. There are so many different kinds of beads, and each one has so many different uses. Accent beads for stringing, fringe and embellishment can be the most difficult to select. Even if we have a particular color in mind, there are still dozens - if not hundreds - of bead styles that could work in our designs. Czech pressed glass beads are some of my favorite accent beads, not only because of the amazing colors, but also because of the interesting shapes. Shells and foliage are among the most versatile pieces, because they can be included in so many different types of themed beadwork. Whenever I’m shopping for Czech glass leaves, I find it hard to decide which of the many exciting colors to choose from. The two-tone color contrasts are stunning and perplexing at the same time. And of course, once purchased, it can be hard to let go of our favorites. I had hoped to use some Halloween colored black-orange leaves this month, but found I couldn’t let them go just yet. 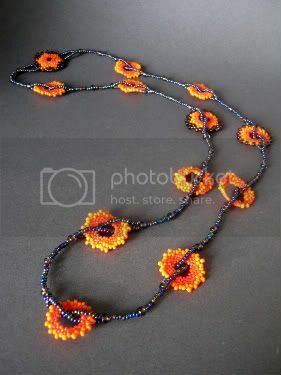 Some excellent examples of beadwork using glass leaves include: Pumpkin Patch Pendant from Linkel Designs; Oil Slick Collar Necklace from Geo Jewelry; and Chartreuse and White Beaded Lariat from Kate Tracton Designs. These pieces take simple glass leaves and turn them into extraordinary works of nature-inspired art. You can try out these pretty little treasures with some simple projects like these: Cornucopia of Leaves Bracelet from Auntie's Beads; Twigs and Branches Earrings from Beading Daily and Pat Wexelblat; and Fall Fringe Necklace from Bead & Button Magazine and Lea Rose Nowicki. 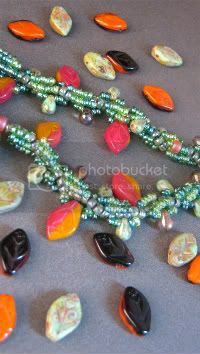 You can also get creative and adapt some of your favorite techniques, or replace your usual beads with leaves for a new look. 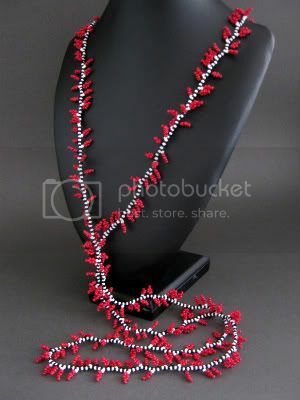 The Flower Petal Necklace from Artbeads.com would look great with pink Czech leaves! The end of October is nearly here, and so is the deadline for this month’s Inspiration Theme entries. If you think you know the theme of October on Inspirational Beading, leave a comment with your guess. The winner will receive a feature for their handmade shop or blog. For most beaders, the idea of scraping a finished project and starting all over again can seem horrifying. Not matter how carefully cuts are made, there will always be materials that cannot be reused, and of course all that hard work is gone. For bead weavers, the unsuccessful project is particularly frustrating, and not just because reusing the beads means plenty of tedious cutting, yanking and stitch ripping. When I create something that doesn’t meet my own standards, I usually add it to my personal jewelry box. The lessons learned are worth the time spent, and I get a new bauble for myself. Still, there are some projects from my first year of bead weaving that have never been worn, and are carefully packed away in little baggies, waiting for their time to be used. As I was going through my finished pieces recently, looking for just the right item to donate to a charity auction, I came across some older necklaces that I had made when I first picked up jewelry making. I had set them aside, too proud to remake them, and too picky to sell them. 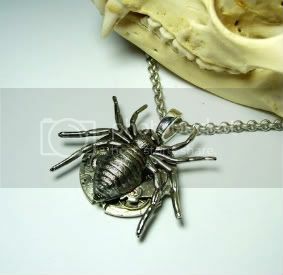 There is one necklace that always makes me feel a little regret that it never made it into the ‘sell pile’. I had made it after making several leaf-fringe necklaces that looked like plants and fruit. I was enjoying the technique, but wanted to do something interesting and unexpected. I think that the red, black and white pattern looks just like the Wicked Witch’s stocking feet sticking out from under Dorothy’s house. My husband says they remind him of the sandworms from Tim Burton’s Beetlejuice. Either way, I love the bright red on black and white stripes, and I decided it was finally time to remake this old design. 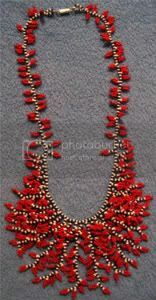 For this piece, all that was needed were simple 11/0 seed beads in black, white and red. The dark shade of red is usually hard to tell from brown, especially when it’s next to the other cherry and tomato beads in my organizer. But next to the stark neutrals, the red really pops. I decided to simplify the design, and let the red fringe really stand out. Instead of a clasped necklace, I created an incredibly long strand of black and white seed beads, stitched it into a circle, and added leaves from start to finish. Although not as intricate as the original, the new necklace still has the same attitude as before, and is of course, completely metal free. As the leaves begin to turn, and the weather brings a shiver or two, many of us begin thinking about things that are dark, spooky and spine tingling. Even when ghosts are not on our minds black, and deep shades like red and auburn, are usually at the top of our fashion must have lists. The creative team at LondonsGate - Seiko and Eric - have been hard at work creating gorgeous accessories that would fit any fall wardrobe. 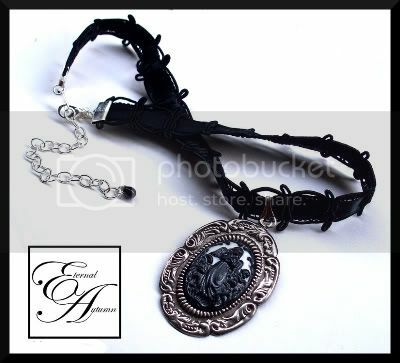 Whether you're into classic and chic, or wild and alternative, their Victorian and Steampunk inspired designs are pleasing not only as delightful baubles, but as works of art, too. Seiko: It actually started when I was a kid. I would take my cheap junkie jewelry and my mom's old broken stuff and piece things together to make something I could actually wear. Or if I lost an earring I'd turn the one side I did have left into a pendant or something. Seiko: I'm inspired by all sorts of things and all sorts of people- just random stuff I'll see during my day to day activities. Someone may be out on the street and will have something on that will catch my eye. Or I could be watching a show on haunted history and see something on one of the re-enactors, or maybe even a piece of furniture, and I'll think "hmmm, that looks pretty cool", and then modify it to suit my own taste. Inspirational Beading: Do you have a favorite material to work with? Seiko: I like working with silver plated items; chains, settings, stampings, charms. The variety is endless. I like it way it looks and it fits my budget, very affordable. Seiko: Ooo, I'd love love love to be able to do glass work. Dale Chihuly's work is so unbelievably amazing but I'm even envious of local glass artists. There's just something so magical about watching artists work with glass. Seiko: I hope to inspire anyone who may think that there are "rules" to creating. I'd like for them to see that when it comes to jewelry making or art/creating in any from, there are no rules or boundaries. They should do what they feel and what they like. It's okay to mix it up and take influences from completely different areas, or combine things in a way that are totally nontraditional, or use things in an unconventional way. I'd like people to see that when it comes to art they should never limit themselves and never hold back. When not indulging in a passion for jewelry design, Seiko spends her time caring for animals, and working in a doggie daycare facility. Eric is a website designer by day, and is currently working on his Oracle Database certification. 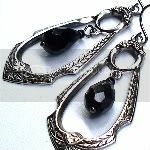 You can find out more about this design team, and view their work on their website LondonsGate, or check in with their blog LondonsGate Steampunk Jewelry. Now that fall is in full swing, shops everywhere are filling up with all kinds of pumpkin goodness for us to indulge in. There are fresh pumpkins ready for carving, canned pumpkin for baking, and for some reason, pre-painted miniature pumpkins that are just meant to look good. The arrival of the big orange fruit is a sure sign that holiday goodness is just around the corner. Fall is by far my favorite time of year. Most of the time, the weather is just right - not to hot and not too cold. And of course, all of the best holidays are strung together at the end of the year, making the coming winter seem much less dreadful. There's nothing more comforting than the idea of a nice warm beverage on cool autumn evening, with a friendly jack-o-lantern lighting up the window. To celebrate the arrival of fall, I thought it would be fun to create something with vibrant and interesting autumn colors. 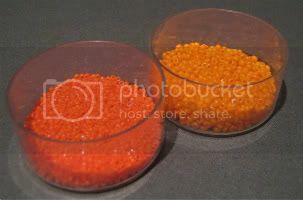 I started with some bright orange 11/o seed beads. On their own they seem sort of garish, but when I paired them up with some orange sunset 15/0's, I saw some spunky personality that wasn't there before. These two colors would be perfect for a fun fall necklace. Using the orange seed beads, I created an assortment of peyote stitch rings using different counts and patterns. Each one is slightly different from the others. After the rings were completed, I searched for the perfect color to pair them with. I wanted something that would make a nice contrast for the orange, but that wouldn't compete with the bright colors. Finally I selected the purplish metallic rainbow mix, and strung all the rings together to complete the piece. It's a bit odd, but still prettier than a jack-o-lantern. 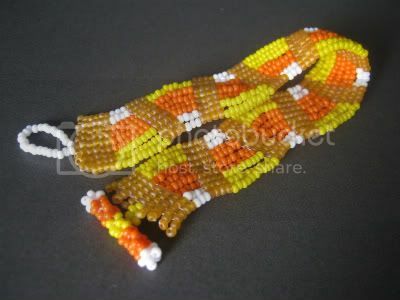 One of the most important stitches that any beadweaver will learn is the versatile and endlessly useful peyote stitch. Also called gourd stitch, the seemingly simple pick-up-one-skip-one pattern can be one of the most frustrating to master. Although the basic concept is easy enough to understand, finding the right tension and making the beads go where they should takes a lot of practice. For first time bead weavers, I always recommend the two-bead version, or two-drop peyote stitch, which follows the exact same pick-up-stitch pattern, but is much easier to handle. By using two beads per stitch instead of one, the beadwork is less likely to curve, sway and twist. You can also create wider pieces of flat beadwork much quicker with two-drop peyote, because you're picking more beads per stitch. 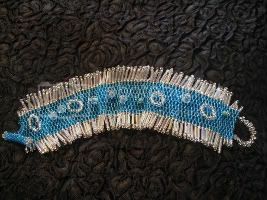 To make a wide cuff bracelet: Select one or more colors of 11/o seed beads, and about 2 yards of thread suitable for beading, such as Nymo or Fireline. Thread a beading needle, and pick up one seed bead. Slide it down until there is about an 8 inch tail, and stitch back up through the bead to form a stopper. 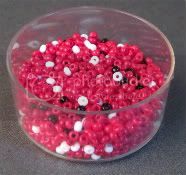 Pick up any number of seed beads divisible by 4 - but not so many that stitching will be difficult. 24 beads is a great number for a basic cuff bracelet. Slide the beads down to the stopper, and turn the beadwork so that the stop-bead is at the top. Pick up 2 seed beads and slide them over the needle, but do not push them down to the main beadwork. Grasp the bottom 4 seed beads from the original 24 with your left thumb and forefinger, making sure that the entire strand is snug against the stopper. With the needle in your right hand, skip the first two beads, and stitch up through the 3rd and 4th seed bead. Pull the thread gently until the new beads are secure against the beadwork. You should now have a little square of 4 seed beads at the bottom of the beadwork. This completes the first stitch. 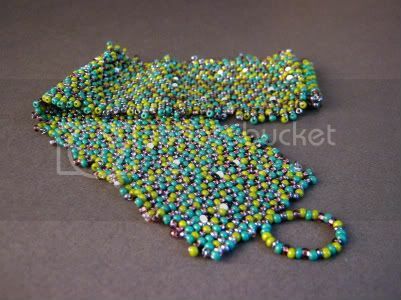 Pick up 2 more seed beads, and perform another peyote stitch: Grasp the beadwork firmly, and skip the next two beads in the strand, stitching up through the following two. Gently pull the thread tight, and make sure the new beads are snug. Continue adding seed beads two at a time until your thread exits the top of the bead strand - do not stitch through the stop-bead. Turn the beadwork over again, so that the stop-bead is at the bottom, and the first row of beads is to your left. 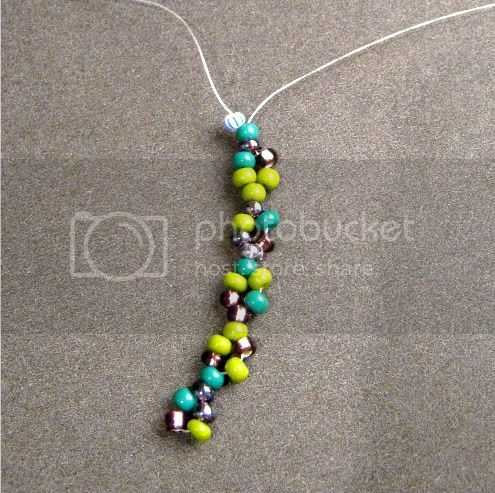 Pick up 2 seed beads, and stitch up through the two raised beads in the previous row. Pull the thread tight. Continue adding beads in this manner, flipping the beadwork to start each new row. To add new thread, remove the needle when there is about 4 inches of thread remaining at the end of a row. 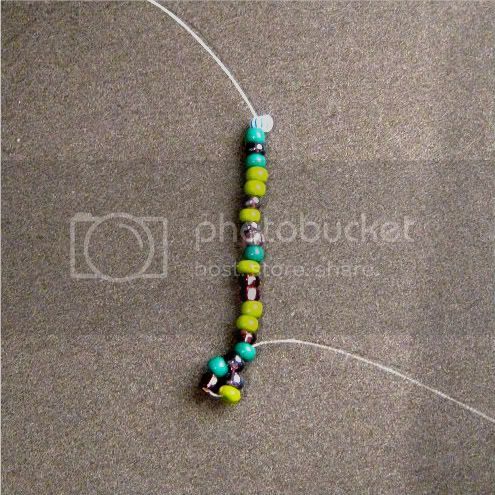 Attach a stop bead to a new length of thread, and stitch into the beadwork at least 6 beads down from your last stitch. Exit from the same beads as your previous thread. Weave the old thread into the beadwork and trim. Pick up the new thread, and continue stitching as before. When the beadwork is the desired length, complete the last row, making sure that your working thread is exiting from the opposite side as the original stop bead, so that the rows are even. Use the remaining thread, and the original tail, to attach each half of a clasp. If desired, you can use your favorite fringe technique to embellish the top and bottom edge of the cuff, which will help protect the threads. My Monster Mash cuff has straight fringe using 2-5 seed beads at random. Give it a try! Two-drop peyote is a great introduction to basic flat beadweaving, and is perfect for one of a kind bracelets! Some images are so intriguing and inspiring, that they stick with us for years and years. Artists and designers of all mediums can attribute many of their ideas to experiences from the past that have never faded from memory. One of my favorite inspiration stories is the origins of the infamous villain Freddy Krueger, who has been able to scare audiences because of his creator's far reaching imagination. The combination of a childhood bully, a strange transient, and a fascination with Eastern religion gelled into what is now a celebrated cult classic film. Although there are some exceptional family movies being produced today, not many of them have the same charm that make classics appealing years later. It's interesting that one of my all time favorite movies - Disney's Snow White - was already a classic when I watched it, and is still around for a new generation to enjoy. One of my favorite scenes from Snow White - the one that sticks with me - is the forest scene. After being condemned by the evil queen, our heroine must flee through a dark and terrifying forest before finding refuge with seven kind little men. In particular, the life-like trees that seem to reach out and grab at poor Snow White are a thrill to see. Those trees were the perfect inspiration for some dark and mysterious beading. I started with some dark brown iris 11/0 seed beads, and added black and gunmetal. For accents and color, I grabbed a few olivine Swarovski bicones, and Picasso 8/0 seed beads. 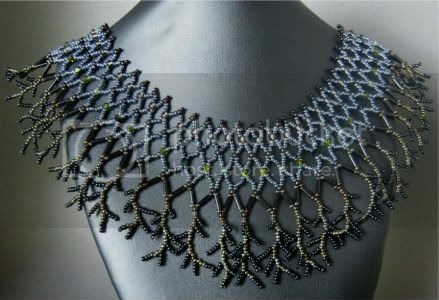 I wanted as many dark finishes as possible, so I also picked out some jet AB bicones and pretty black bugle beads. My first idea for creating some scary forest trees was to use branch fringe. After some musing and sketching, I decided to use netting as a base, and create a forest of fringe along the edge. Each point on the netted color has a tiny set of branches, with gradual increases in size. To keep the necklace from getting too busy, I maintained a strict number of beads for each fringe, with the centers of the "trees" growing larger every few rows.